It's National Pie Day, an annual celebration of pies started in the mid-1970s by Boulder, Colorado nuclear engineer, brewer, and teacher Charlie Papazian. He decided that his own birthday, January 23, would be National Pie Day. Now that's interesting because my favorite birthday treat is... pie! While on a press trip around Utah and Arizona my birth date was looming. 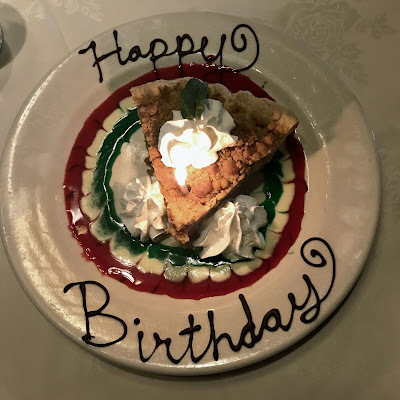 I shared with a couple of confidants (whom I later realized would spill the beans) that pie was a special treat for me on my birthday and it had to be fruit pie—apple, cherry, berry, peach or mixed fruits and a wonderful flaky crust. 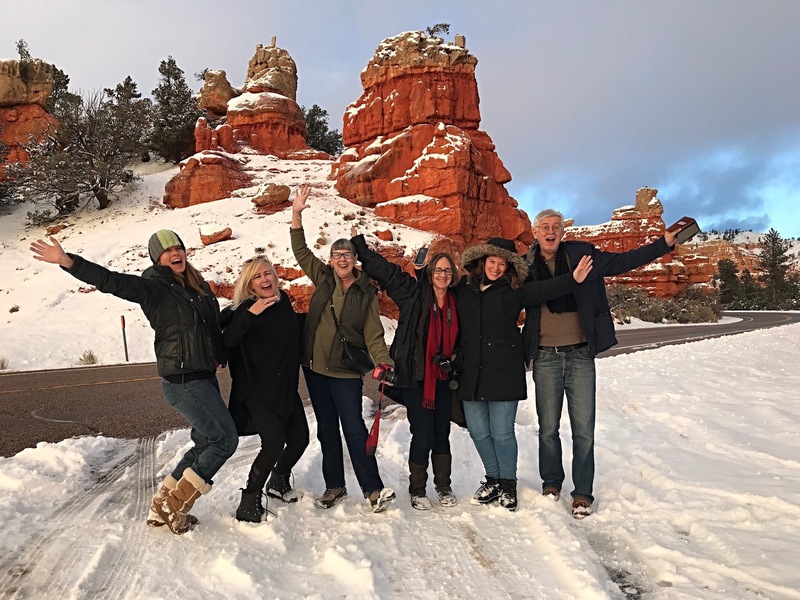 My fellow journalists and pie fans on the road in Bryce Canyon. So it began. Days before my actual birthday, my traveling companions did all they could to help me find the absolute best pie in the state of Arizona. 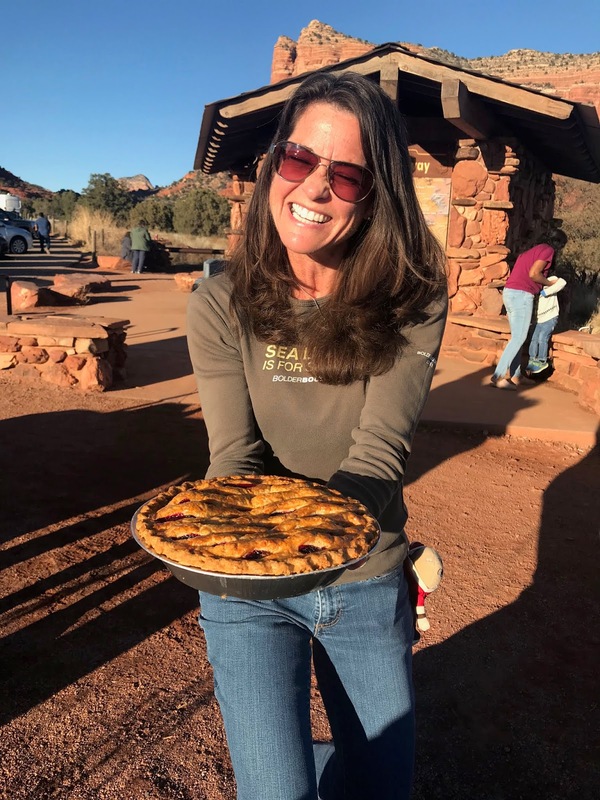 First, at the Grand Canyon, El Tovar trotted out their best candidate for the designation of "Best Birthday Pie." It was a glorious crumb-topped fruit pie with the decoration of the season—red and green. It was beautiful and the pie was delicious. If there was a category for best presentation, El Tovar would have won it! 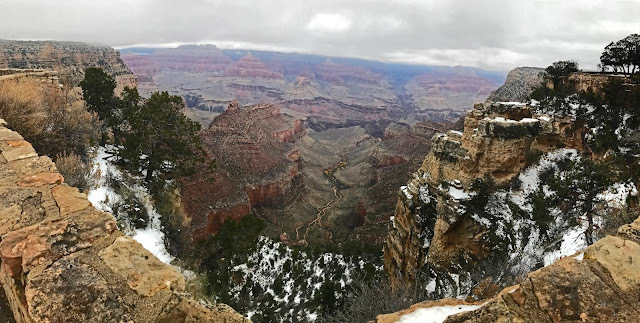 As it was, it was great fuel for a day of walking, enjoying the spectacular scenery and enduring a bit of winter chill. The Grand Canyon in winter. Berry pie a la mode at the Hopi Cultural Center restaurant. 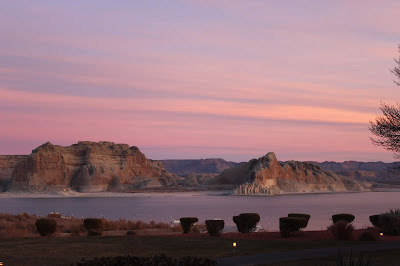 When we visited Lake Powell, we were entranced by the vistas, the magic of sunrise on the cliffs and the excellent dinner we enjoyed at the Lake Powell Resort. Add in some amazing California wine hand-selected by wine writer Barbara Barielle, and we easily drifted off to sleep. At dawn, the birds were chirping and the sunrise drew me outside. Little by little, the lake was lighted by the sun as I watched. Our host, Robin Marquis, had yet to hear about the pie-quest but by the time we all reached Sedona and she joined us for a hike around the Bell Rock vortex, apparently, she had heard. After our hike and some magnificent photo ops, Robin surprised me with a glorious pie. This one, from Marie Callender's, hit the spot after our day outdoors. It was an excellent pie. But was it to be the absolute best in Arizona? Robin Marquis surprises me with yet another pie to try! 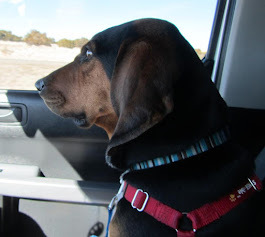 On the last day of the trip, and my actual birthday, writer Barbara Barielle and I headed south from Flagstaff and planned for a stop at Black Canyon City. You see, this little desert town is rather famous for pie and bar-b-ques (Rocky Mountain oysters anyone?) and wouldn't a travel and food writer need to stop in and see what all the fuss is about? This little desert oasis (food-wise, that is) has been there for over 100 years. In 1918 it started out as a little general store. 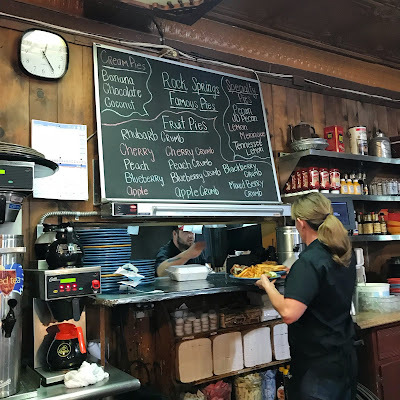 Rock Springs Cafe has been a must-stop on the drive north from Phoenix up I-17 for decades and became a favorite stop of mine when I lived in the West Valley fifteen years ago. I could remember picking up Thanksgiving pie and needing two hands to carry the weighty fruit-laden pie to my car. And now I was back and the anticipation was growing. 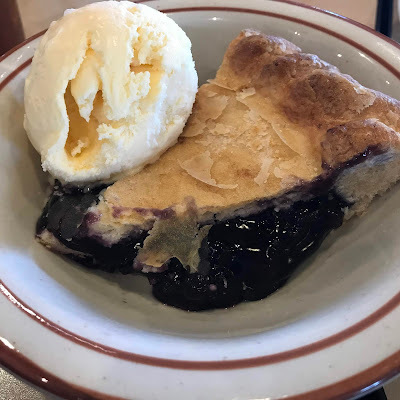 Would this be the best pie in Arizona? Pies filled the cold cases and the shelves at Rock Springs Cafe but in order to experience this much-anticipated piece of pie, we were directed to the "pie counter." We perused the chalk board and found that a few of the selections had sold out. It was only mid-day and they were sold out? So I opted for a piece of simple peach pie. No whipped cream, no ice cream—just a good old fashioned piece of pie. The pie slice was soon delivered from the kitchen and it looked great. The peaches were a deep color and the crust looked flaky enough. Once I took my first bite I knew—this was the best pie of the trip. Rock Springs Cafe had delivered just as they did when I lived in Arizona many years ago. 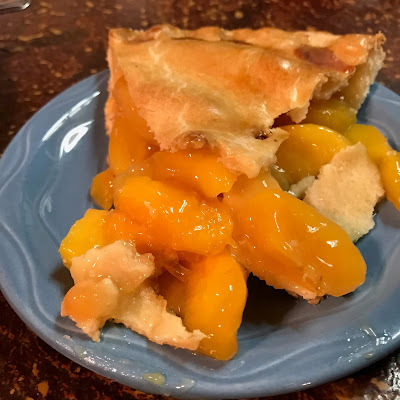 Rock Springs Peach Pie—the best pie in Arizona! Right then and there I dubbed that Rock Springs Cafe piece of pie as THE BEST PIE IN ARIZONA! So on National Pie Day in rainy Washington State, my thoughts turn to sunny Arizona and that wonderful piece of pie. 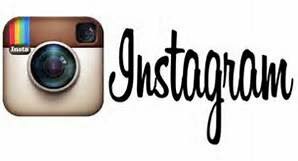 Note: The author toured as a guest of the Grand Circle Association. 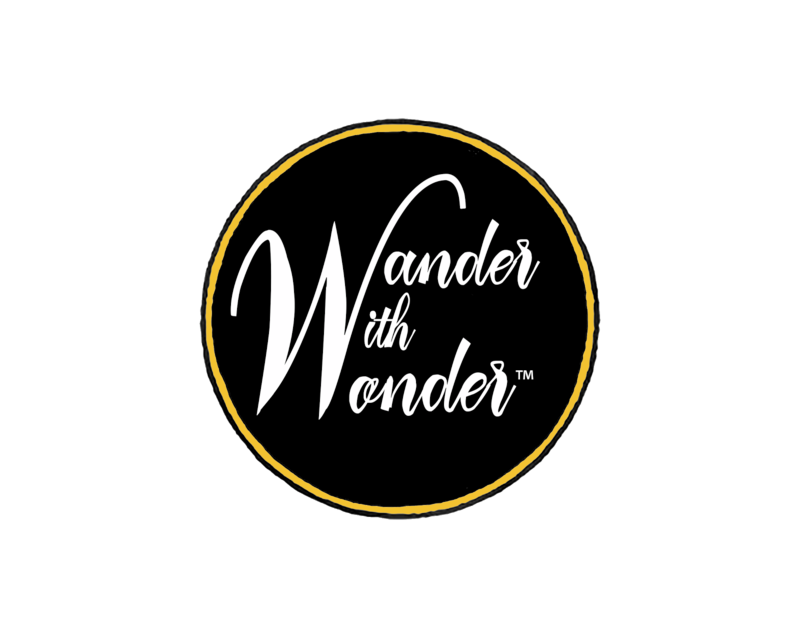 As is common in the travel industry, the writer was provided with complimentary accommodations, meals, and other compensation for the purpose of review. While it has not influenced this review, the writer believes in full disclosure of all potential conflicts of interest.